This brief provides evidence of a dramatic change in Michigan’s health care landscape as a result of the first year of the ACA’s coverage expansions. Overall, the number of residents reporting they were uninsured, struggled to pay medical bills and/or delayed seeking needed medical care has dropped significantly compared to CHRT survey findings before the launch of the ACA coverage expansions. 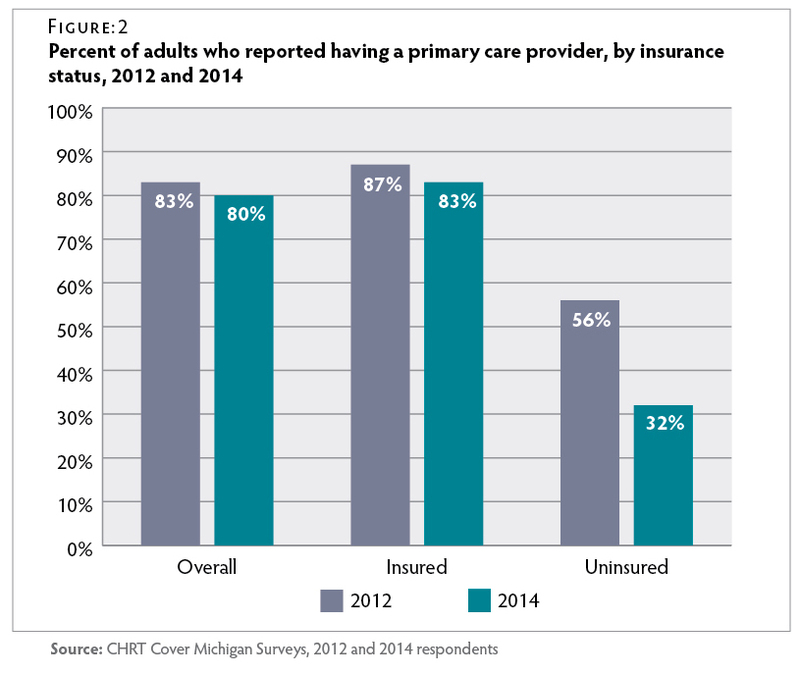 While most insured Michiganders reported easy access to primary care, they did, however, report a greater challenge in obtaining access to specialty care in 2014 than they reported before the ACA coverage expansions. 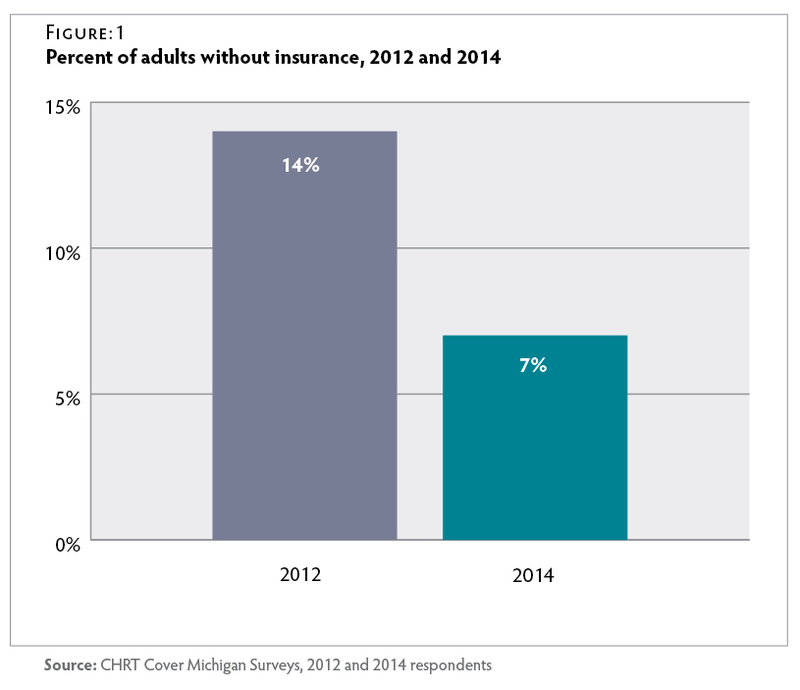 More people gained coverage—the proportion of adult Michiganders who reported being uninsured was cut in half, from 14 percent in 2012 to 7 percent in 2014. 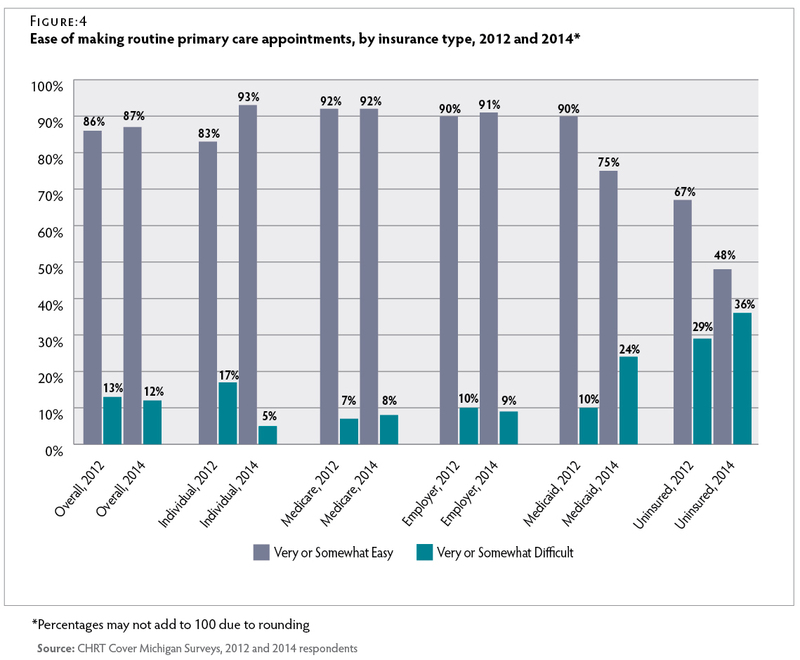 Overall, from 2012 to 2014, those with insurance coverage reported access to primary care remained easy. Nearly 90 percent of insured adults reported having very or somewhat easy access to routine primary care appointments in 2012 and 2014. Fewer people reported that they had delayed seeking medical care—22 percent of all respondents reported that they had not sought medical care they believed to be necessary in the previous six months in 2014, compared to 29 percent in 2012. In 2014, half as many respondents cited cost as a reason for not seeking needed medical care (21 percent, compared to 42 percent in 2012). In 2014, 20 percent of respondents reported struggling to pay medical bills, compared to 27 percent in 2012. 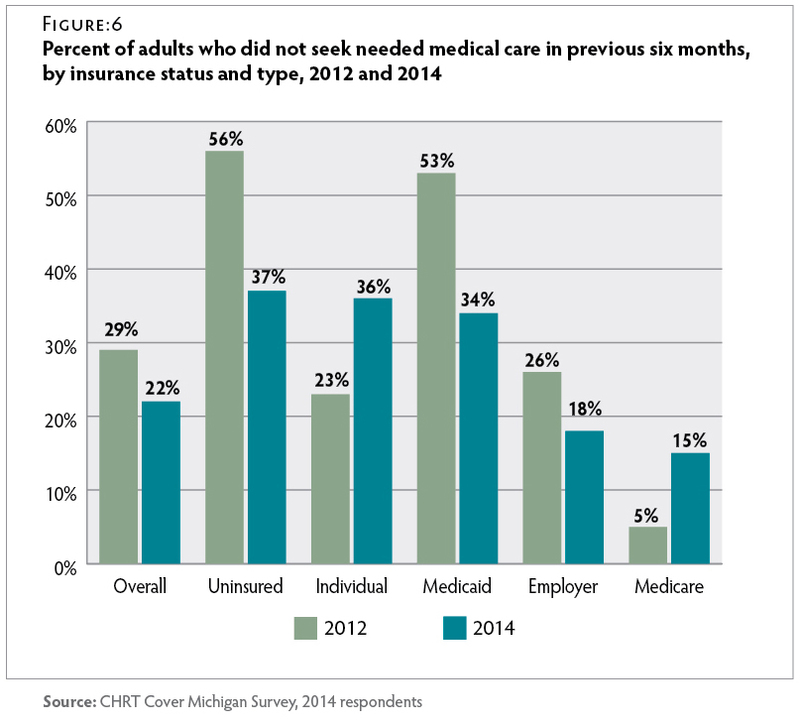 Uninsured adults reported that it was more difficult to obtain primary care between 2012 and 2014. Those who reported very or somewhat easy access to primary care appointments declined from 67 percent in 2012 to 48 percent in 2014. 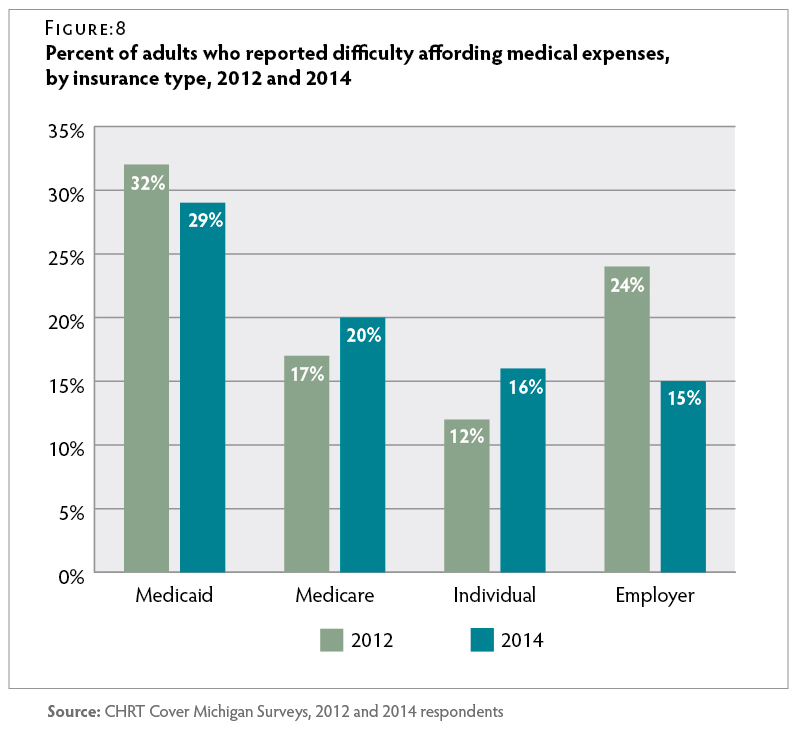 More people reported difficulty obtaining access to specialty care in 2014 compared to 2012. Specifically, 34 percent of adult Michiganders reported it was “very easy” to get an appointment with a specialist in 2012, compared to 24 percent in 2014. Among those who had been uninsured sometime in the 12 months prior to the survey, 50 percent reported obtaining their coverage through either Medicaid or by purchasing individual coverage (on or off the Health Insurance Marketplace). Slightly more than one-third of those who obtained coverage reported that they obtained it through an employer. 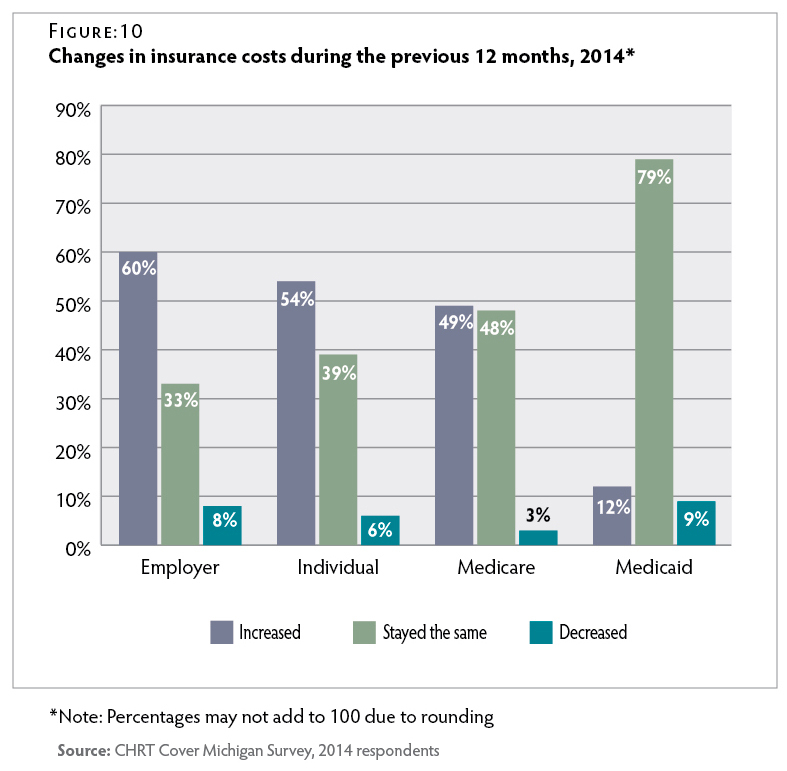 These increases are likely due to the impact of both the ACA’s insurance expansion provisions and an improving economy in Michigan. In 2014, 87 percent of all respondents said it was “very easy” or “somewhat easy” to make routine primary care appointments. 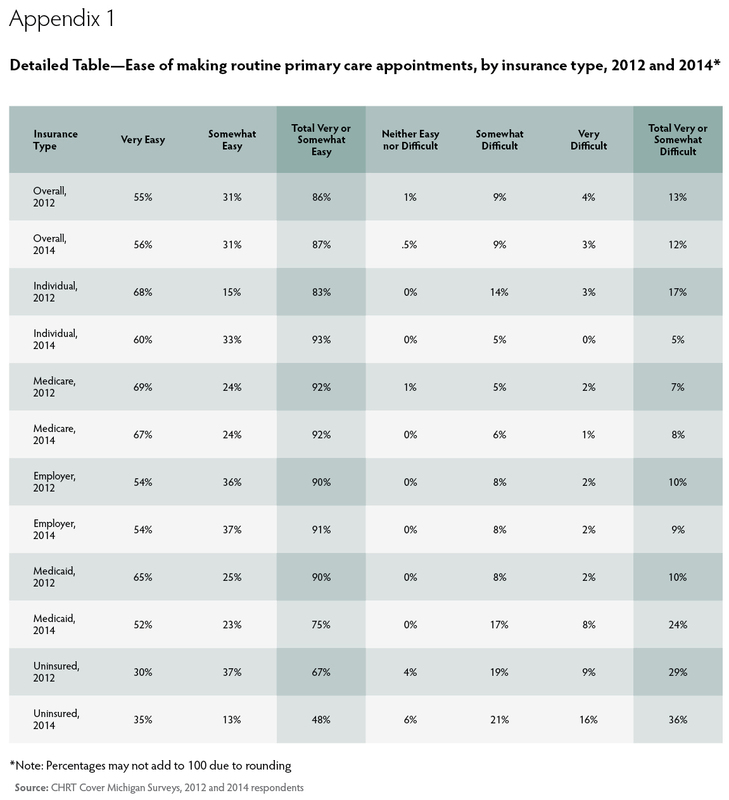 However, only 48 percent of 2014 uninsured respondents reported such a high level of ease when making appointments for routine primary care, a significant decline from 2012. Figure 4 A detailed set of frequencies is provided in Appendix 1. The proportion of respondents who reported they had sought specialty care increased between 2012 and 2014, from 88 percent to 95 percent. 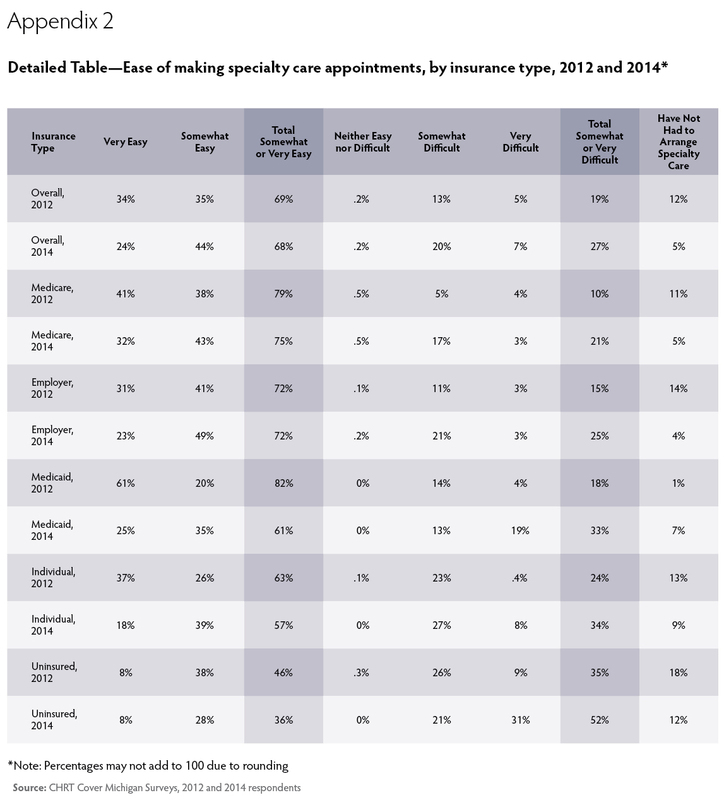 Perhaps because of the increased demand for appointments, only one-quarter of Michigan residents reported that it was “very easy” to make specialist appointments in 2014, a nearly one-third decline since 2012. 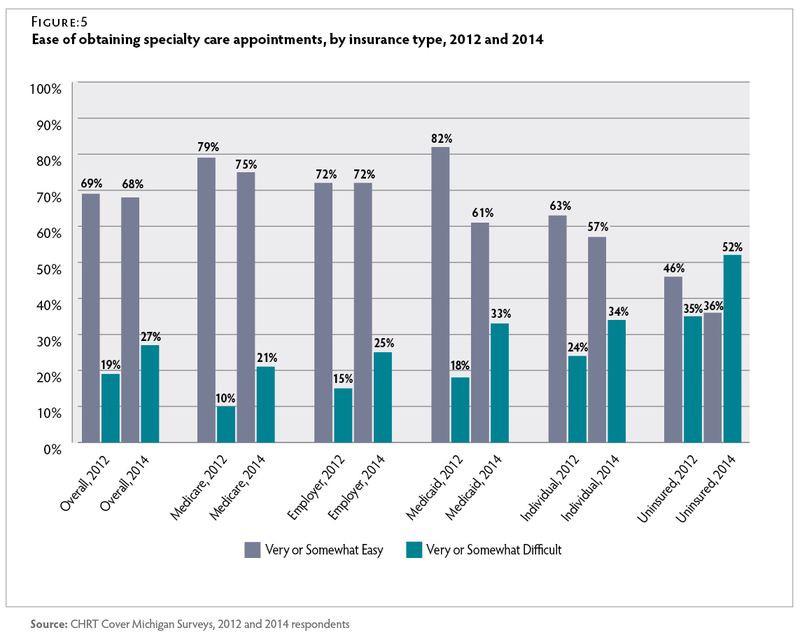 Reported ease of making specialty care appointments declined most among those with Medicaid. Figure 5 A detailed set of frequencies is provided in Appendix 2. 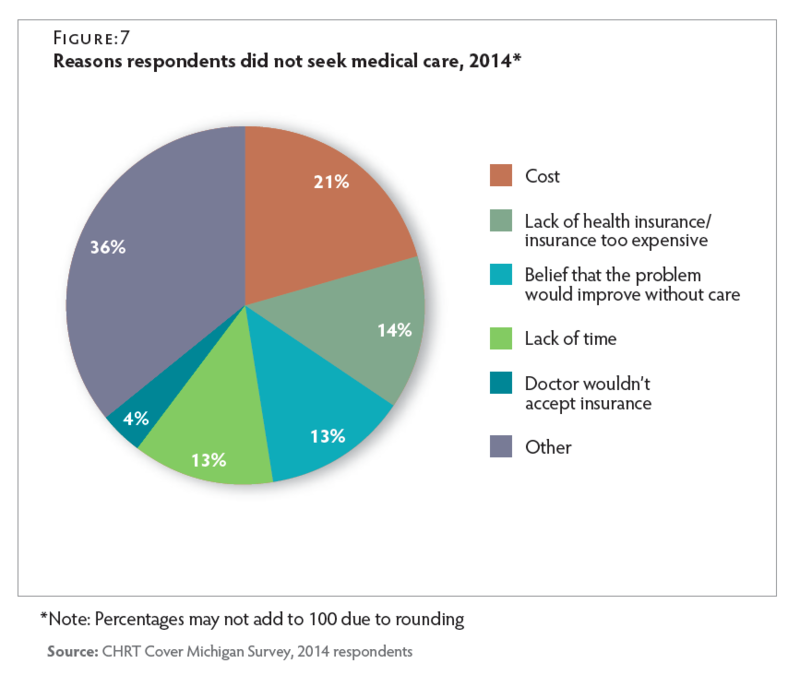 Twenty-two percent of Michigan residents reported that they had not sought care they believed was necessary in the six months prior to the 2014 survey, a significant improvement from the 29 percent reported in 2012. Twenty percent of respondents to the 2014 survey reported struggling to pay their medical bills during the previous year, compared to 27 percent in 2012. 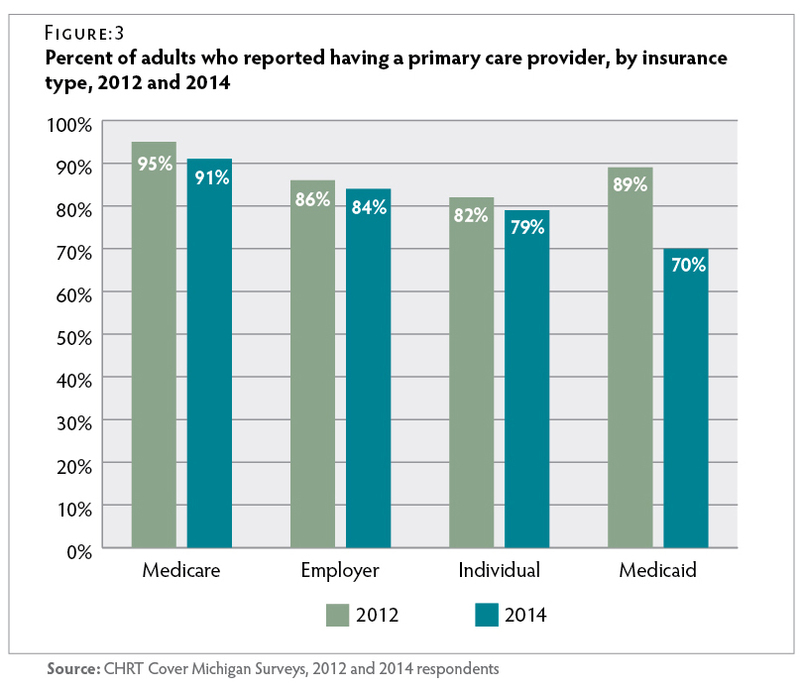 In 2014, Michiganders with employer-sponsored coverage were significantly less likely to report having struggled to pay their medical bills during the previous year compared to 2012 respondents. However, the share of respondents with individually-purchased coverage who reported difficulty affording medical bills did not change significantly between the years. 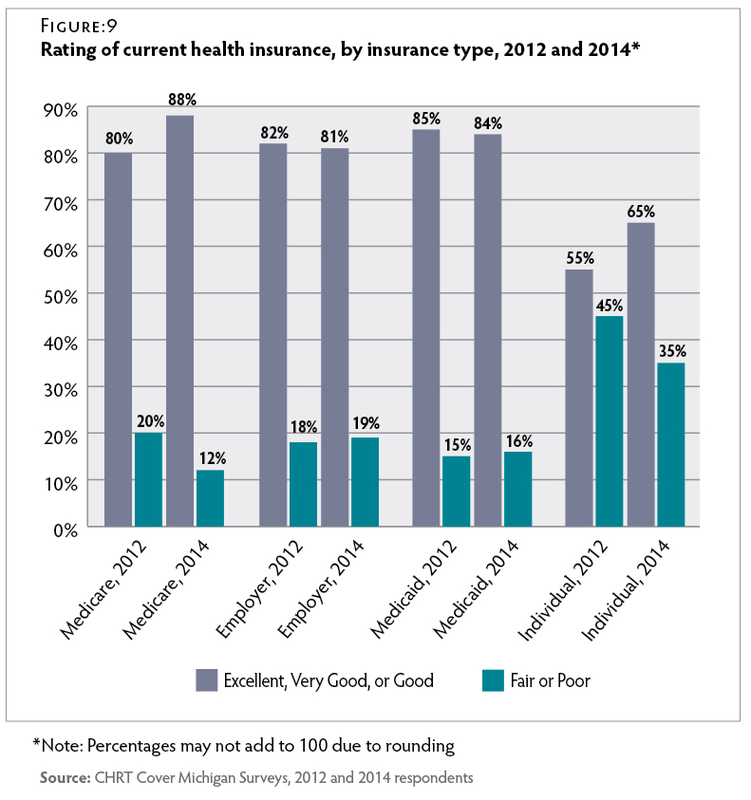 Overall, 81 percent of 2014 respondents rated their coverage as “excellent” (21 percent), “very good” (31 percent), or “good” (29 percent) compared to 78 percent in 2012. Important differences exist by type of coverage. In 2014, 88 percent of those with Medicare rated their coverage as “excellent”, “very good”, or “good”, compared to 84 percent with Medicaid, 81 percent with employer-sponsored coverage and 65 percent with individual coverage. In comparison to 2012, satisfaction with coverage improved for those with Medicare (up from 80 percent in 2012).6 Respondents with Medicare were also less likely to rate their coverage as “fair” or “poor” in 2014 compared to 2012 (12 percent in 2014, compared to 20 percent in 2012). 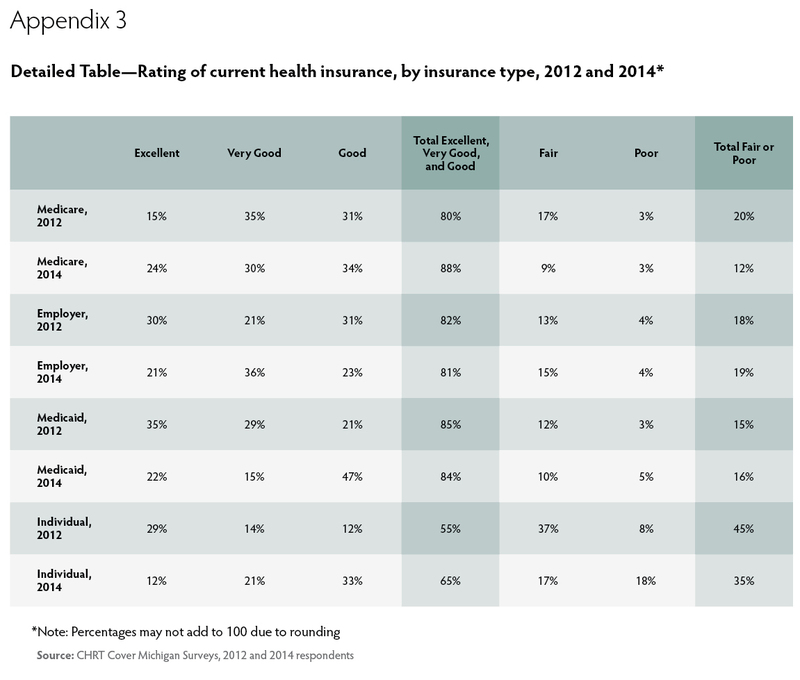 In 2014, those with individually purchased coverage were more likely to have rated their coverage as “excellent”, “very good”, or “good” (65 percent in 2014, compared to 55 percent in 2012)7 and less likely to rate their coverage as just “fair” or “poor” (35 percent in 2014 and 45 percent in 2012).6 Figure 9 A detailed set of frequencies is provided in Appendix 3. Overall, when asked to compare the quality of their coverage at the time of the survey to the previous year, 71 percent of respondents reported their coverage quality had stayed the same, 17 percent reported the quality had worsened, and 12 percent indicated that the quality improved. Of respondents who had individually-purchased insurance both at the time of the 2014 survey and 12 months previously, two-thirds reported that the quality of their coverage did not change during that time. Cover Michigan Survey 2014:8 The survey data presented in this brief were produced from a series of survey questions added to the Michigan State University Institute for Public Policy and Social Research (IPPSR) quarterly State of the State Survey. The survey was fielded between September and November 2014 and included a sample of 1,002 Michigan adults with a 20.2 percent response rate. The margin of error for the entire sample was ±3.9 percent with design effects. The sampling design, a random stratified sample based on regions within the state, was a telephone survey conducted via landline and cellular phones of Michigan residents. Cover Michigan Survey 2013: Comparison data presented in this brief were produced from questions added to the State of the State Survey fielded between August and October 2012, which included a sample of 1,018 Michigan adults. The margin of error for the entire sample was ±6.5 percent with design effects. Analysis: For analytical purposes, survey data were weighted to adjust for the unequal probabilities of selection for each stratum of the survey sample (for example, region of the state, listed vs. unlisted telephones). Additionally, data were weighted to adjust for non-response based on age, gender, and race, according to population distributions from the 2009-2013 American Community Survey data. Respondents who reported both Medicare and Medicaid coverage were considered Medicaid recipients for the purpose of this analysis. Results were analyzed using SAS 9.3 software. Statistical significance of bivariate relationships was tested using z tests or chi-square tests for independence. All comparison tables are statistically significant at p ≤ 0.05 unless otherwise noted. A full report of the IPPSR State of the State Survey methodology can be found at: http://ippsr.msu.edu/soss/. Suggested Citation: Smiley, Mary L.; Riba, Melissa; Ndukwe, Ezinne G.; Udow-Phillips, Marianne. 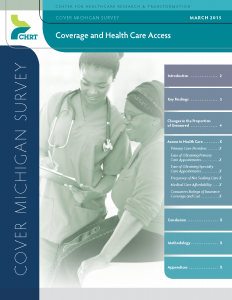 Cover Michigan Survey: Coverage and Health Care Access. (Ann Arbor, MI: Center for Healthcare Research and Transformation, March 2015). “Healthy Michigan Plan Enrollment Statistics.” (Lansing, MI: Michigan Department of Community Health, Feb. 2015). (accessed 2/11/15). “Health Insurance Marketplace: Summary Enrollment Report for the Initial Annual Open Enrollment Period.” (Washington D.C.: U.S. Department of Health & Human Services, May 2015). (accessed 2/17/15). U.S. Department of Health and Human Services. May 2014. Profile of Affordable Care Act Coverage Expansion Enrollment in Medicaid/CHIP and the Health Insurance Marketplace, 10-1-2013 to 3-31-2014: Michigan. (accessed 3/13/15). Not significant at p ≤ 0.05. Beginning with this Cover Michigan Survey, CHRT will identify future Cover Michigan Survey data by the year in which the data was collected. Previous CHRT Cover Michigan Survey publications use the year inwhich the document was published.